As the weather starts to cool down outside, creepy critters start to scurry inside. It's great to have a warm and inviting home, but no one likes ants in the kitchen, spiders in the corners, or those pesky fruit flies all over the house. One solution to this bug problem is to spray your home with insecticides, but these leave harsh chemicals which can be harmful for children and pets. Another solution can be reaching for a "one time" bug spray, like Raid, each time a bug comes around, but that can get old really quickly. Luckily, there are easy pest remedies for the season's most annoying house guests. It's been my experience that two minutes after one fruit fly gets into your home, there is a population explosion and there are 1,000 fruit flies in your home. To trap these tiny pests, put a piece of old, skinless fruit (like peeled banana, peeled apple, or cut strawberry) in a small bowl and cover tightly with plastic wrap. Alternately, you can use a sweet wine or a combination of both fruit and wine. Dish soap in the mixture can also help, since it can weigh the flies' wings down. Once the bowl is covered, poke very tiny holes in the plastic wrap with a toothpick. This way, the flies can get in, but not out again. Make sure to clean out the trap periodically and replace the fruit, to keep those little pests coming. There are two main factors that contribute to ants in the house, easy access points to the house and food that has been left out. To deter ants, make sure to keep food sealed in air-tight containers and keep sinks clean (including the drain). If you're noticing ants marching in from certain places, sprinkle cinnamon around those areas since ants hate cinnamon and will keep away. Mosquitoes are perhaps the peskiest pests of them all. Luckily, keeping them away from you is actually really simple. Mosquitoes are very light and their wings aren't terribly strong, so all you need to keep them at bay is a fan. Mosquitoes cannot land in a crosswind and they don't have the strength to fly into a breeze. So, turn on your fan for a nice evening breeze, and enjoy being mosquito free. Crickets can be especially annoying house guests due to their impromptu concerts. Luckily, there is an easy way to trap the little chirpers. Just place a few spoonfuls of molasses in a shallow bowl and fill the bowl halfway with water. Place the bowl in the room where the crickets are performing. Crickets go crazy over the smell of molasses, but get stuck in the bowl once they hop in to explore. Throughout the year, there can be times when it feels like ladybugs are taking over your home. But, there is one thing that ladybugs truly hate (probably as much as you hate having them in your home), and that is the scent of lemon. Fill your home with lemon-scented candles, clean with lemon-scented products, or utilize fresh lemons in cleaning. The smell with deter ladybugs from hanging out with you for too long. Spiders are the crawlers that eat the other pests in your home, so really they're doing a favor. But they are also really creepy, so they're not always welcome guests. 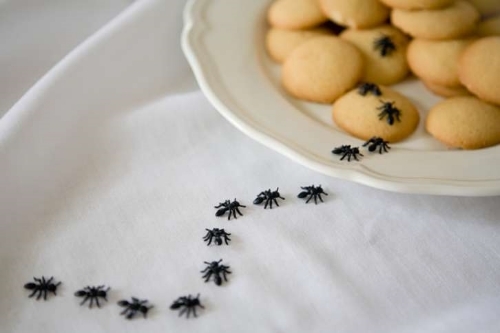 Since other bugs are their main food source, using these tips to trap or deter other bugs will cut down the spider problem as well. If you find that they are still making their way into your home, add caulk or putty to any cracks around windows, doors, or on the walls. These are prime entrance points, and hiding spots, for spiders. Eventually the winter will come, and most of the bugs will die out, but keep these tips handy, because in the Spring, those pests will be back out in full force! Also note that these tips are for small-scale infestations only. If your home is truly being overrun by bugs, the best bet would be to call a professional exterminator. Find this post helpful? Visit our services page, so we can help you more! What have you done to Keep the Critters out? Post in the comments below and Subscribe to our blog! Thank you! We promise it'll be cool!